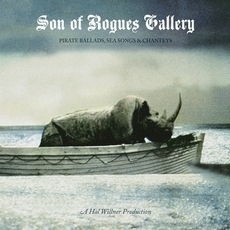 Son of Rogue’s Gallery: Pirate Ballads, Sea Songs & Chanteys, produced by Hal Willner, will be released February 19 on Anti Records. Executive produced by Johnny Depp and Gore Verbinski, the compilation two-disc recording of sea shanties features Tom Waits, Keith Richards, Iggy Pop, Nick Cave, Patti Smith, Sean Lennon and many more. Thirlwell mixed the track “Barnacle Bill The Sailor” by Kembra Pfahler (of The Voluptuous Horror Of Karen Black infamy), on which she was joined by Antony Hegarty, who sings the refrains, and Joseph Arthur. While working on the two “Pirates Of The Carribean” films, Johnny Depp and director Gore Verbinski became fascinated with the lore and fable of the pirates and sailors who ran the high seas. Enter legendary producer Hal Wilner, who brings his knack for matching maverick musicians with extraordinary material. The “Rogue’s Gallery” albums offer a look at the hardships, the horrors, the lusts and lurid depths, and the crystal beauty that led men to the sea in ships for hundreds of years.